beautiful movie that everyone wanting to see true love should see. Rated PG-13. Oscar Winner!! 2. THE NOTEBOOK-This movie is a beautiful love story taken from the best selling novel by Nicholas Sparks. One of the greatest romance writers. His love stories will definetly have you crying by the end, and this story is about two people who are torn apart, but are destined to be together.PG-13. 3. 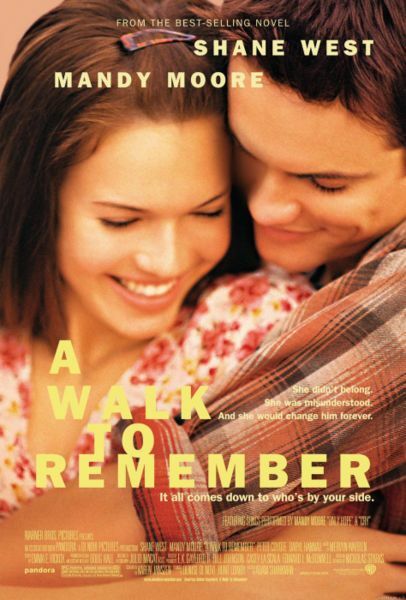 A WALK TO REMEMBER- Another class by Nicholas Sparks that is a beautiful portrayal of teen romance, and a heartbreaking story that you will never forget. Rated PG-13. 4. EVER AFTER- A classic version of the story Cinderella. Rated PG-13. 5. SHAKESPEARE IN LOVE- Have YOU Ever Wondered about the actual story of William Shakespeare, and the ideas behind his writing. This is a beautiful love story about the man behind the writing. Oscar Winner! Rated R.
7. PRETTY WOMAN- I don't Know anyone who has seen this story and has not fallen in love with it. This story takes place in California, and is about a rich man who falls in love with a poor girl who desperatly needs to be cared for. Rated R.
8. The Blue Lagoon- A beautiful love story that takes place on a deserted island between a young man and women who never no one else on this world except each other. Rated R.
9. NOTTING HILL- A love story that tells the tale of a romance between a poor man, and a famous actress. Rated PG-13. 10. THE PRINCESS BRIDE- One of the older movies in these top ten, but just as romantic as the others. It is an adventerous romance, that will keep you entertained until the end! Rated PG. I love romance movies, and these ten films will definetly have you believing in love by the end!! THESE TEN ROMANCE MOVIES WILL HAVE YOU FALLING IN LOVE.